Since its opening, the 16th Street Mall in downtown Denver has attracted plenty of tourists and locals alike. It’s become the hot spot for dining, shopping and simply hanging out with a good friend. Because of all the business that it does and all the people that it attracts on a daily basis there is a need for proper garbage management at the mall. That’s why the 16th Street Mall implemented a recycling program utilizing 10 separate containers strategically placed throughout the mall area. These containers allow anyone to drop off recyclable materials just as they would in their own home. The accepted items include the usual suspects of glass bottles, plastic bottles, aluminum cans, newspapers, magazines, phone books, and brown paper bags. What you can’t throw out in these specific recycle bins are paper cups, plastic cups, takeout food containers, plastic bags, cardboard milk or juice cartons or any food waste. Of course, not everyone is aware of these rules and just sees a recycle bin as another trash container. This makes the off-site sorting a bit more of a challenge. While this is a great idea for the mall it’s not really a practical approach for all your recycling needs. After all, if you have home recycling then you don’t really need to take your materials down to the mall for a drop off. Also, what about all of those large bulky items that you’d like to recycle such as old furniture or kitchen appliances? To handle those items you need to contract a special team of experienced junk haulers like Junk King Denver who are we knowledgeable in eco-friendly practices. For folks living in Denver it’s easy to “go green.” That’s because of the strong municipal sponsored recycling programs. But as mentioned they can only go so far in terms of what the weekly pickup can handle. Just because you have an old sofa or refrigerator you want to get rid of doesn’t mean it can’t be recycled. As you shop for junk haulers the first question you should ask is where will your junk end up? An eco-friendly junk hauler should be able to tell you that they’ll be diverting most of your trash to the proper recycling center. Not all recycling centers are created equal. Some are designed just for a specific type of material such as plastic or newspaper. But for those big items you might need a center that can handle scrap metal, wood, upholstery and fabric. It could mean a separate facility for each one of those items. The good news is that you don’t have to spend your precious free time driving around Denver to make those drop-offs when you’ve got an experienced crew like Junk King who can handle it for you. The goal of any eco-friendly waste management program is to divert as much waste and junk away from the landfill. Even with the new regulations pertaining to landfill construction this is definitely a case where less really is better. This entry was posted in Denver Furniture Disposal, Denver Junk Hauling, Denver Junk Recycling, Junk King Denver and tagged Bulky Item Recycling, Denver Junk Recycling, Denver Recycling, Get Rid of Junk Denver, Recycle Junk Denver on January 31, 2012 by Paul Durant. Last updated August 1, 2017 . Although the hopes for a Denver Broncos Super Bowl have faded, that doesn’t mean the big game won’t be watched all across Colorado. In America the Super Bowl has achieved the same kind of devotion as other national holidays like Thanksgiving or the 4th of July. It’s a day to focus on the game, snacks and those amazing commercials. It’s also the perfect occasion to throw a party with or without the beloved Broncos! If you want to toss a pigskin party you might be thinking about switching up things a bit in terms of furniture and a television. In other words, the Super Bowl could be a perfect excuse to redo the family room! As with those other holidays, you might just be amazed at the bargains to be had for big screen televisions and furniture leading up to Super Bowl weekend. On the television front, retailers know that when it comes to the Super Bowl bigger is better. That’s why they’ll be offering deep discounts on the very latest HDTV. It’s also a great way for them to move out all the inventory leftover from the holidays. If you haven’t had the pleasure of watching a game or movie on high definition then you don’t know what you’re missing. It’s the next best thing to 3D! In terms of furniture, you’ll also find showrooms offering great bargains on sofas, loveseats and other living room arrangements. This could be a chance for you to reconfigure the entire family room. Instead of sitting on that lumpy and uncomfortable sofa you’ve been using for years, you can find a cozy replacement. That new sofa can also be protected when it comes to spills which is another Super Bowl party tradition! You could also discover some new designs in recliners and coffee tables that will improve the quality of time you spend in your new family room. After all, once the Super Bowl game is over, you’ll still be spending many hours to come enjoying other programs on your new television. There are some recliners who have built in massage elements which make it hard to ever leave the chair. For a coffee table, you might look into a model which has a retractable top that pulls up to provide a kind of table extension. This takes enjoying a snack in front of the TV to a whole new level. Part of your remodel project should also include getting rid of your old furniture and television. This can be accomplished by enlisting the services of a professional team of junk hauler like Junk King Denver. 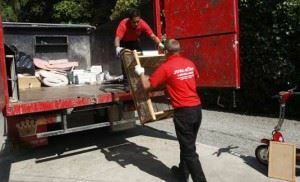 His pro hauling team can show up on the same day your new furniture will arrive and make sure the room will be clear. While they are at it, they can also cart off any other bulky junk items you’ve targeted for removal. As for the Broncos, there’s always next year but at least with your new TV and sofa, you’ll be ready! For the best in Denver Furniture disposal, simply call 1-888-888-JUNK or book a free on site estimate online. This entry was posted in Denver Furniture Disposal, Denver Junk Hauling, Denver Junk Removal, Junk King Denver and tagged Denver furniture dispsoal, Denver Junk Removal, furniture pickup, get rid of furniture denver on January 24, 2012 by Paul Durant. Last updated August 1, 2017 .